February 11, 2019 | 12 p.m. — 1 p.m.
Have you ever raised your hand to speak and barely a squeak came out? Have you formed an entire speech in your mind, only to go blank when it was your turn to present? This conversation will help you avoid losing your power and teach you how to create confidence and strength in the moments when you need it most. Build a sense of control and strength in high-pressure settings, enhance your presence, and present yourself with authority while representing expertise and ideas. Angela Lussier is an award-winning speaker, six-time author, two-time TEDx presenter, and CEO and founder of the Speaker Sisterhood. Angela is the host of Claim the Stage, a public speaking podcast for women rated #1 on the inspiring podcasts list by Forbes in 2017. She is a contributor to Huffington Post and her work has been featured on ABC, NBC, Forbes, Virgin, and Entrepreneur. Her motto: Stop waiting. Start creating. Strategic Alliances is recognized by SHRM to offer Professional Development Credits (PDCs) SHRM-CP or SHRM-SCP. 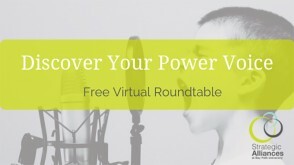 This virtual roundtable is worth 1 PDC.